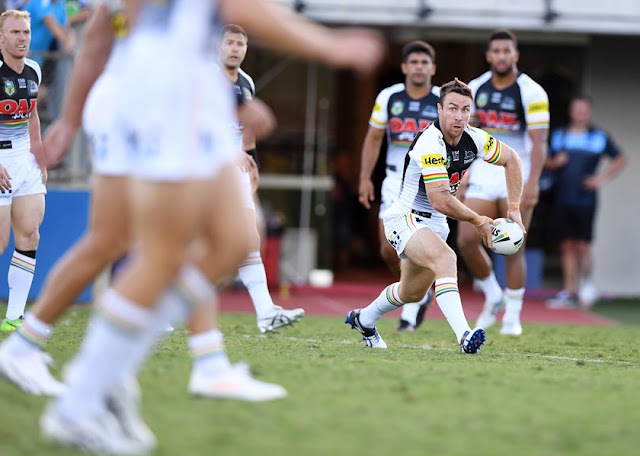 In-form Penrith Panthers halfback James Maloney believes his former club is not using new recruit Matt Moylan the right way and has welcomed his return to fullback in recent weeks. Maloney will return to Southern Cross Group Stadium on Sunday afternoon to face the Cronulla Sharks club he departed in the off-season as part of a swap deal with Moylan. The veteran playmaker has not missed a beat since moving to the foot of the mountains, but Moylan's transition hasn't been as smooth sailing with Sharks coach Shane Flanagan continuing to tinker with his line-up. "I think Matty is a real quality player, I've always had a high opinion of Moyza [but] I don't think they're bringing him into the game," Maloney said. "Now at fullback, he's going to get more opportunities. He's a natural fullback. At five-eighth they probably weren't playing the right style of footy to have him at five-eighth. "He's a high-quality fullback, been at the top of his game and represented his country at fullback. "He's a dangerous player and someone we'll have to do a job on." Maloney joked he's used to coming up against former teams because it almost happens every week after joining a fifth club over the summer break and would treat the game like any other. Panthers teammate Corey Harawira-Naera viewed the occasion differently. "He'll be getting us up for it for sure, he won't want to be losing to his old club," Harawira-Naera said. "Jimmy has brought a lot of experience and is like another coach out on the field without Nath [Cleary] there. It's like we're not even missing him. "As soon as there is a try or break in play he pulls us together and tells us what we need to do. It just flows and makes it easier for someone in a different position to snap into play." The Panthers and Sharks will meet at a time where injuries are taking their toll. Skipper Paul Gallen may miss as many as six weeks with a knee injury, while Andrew Fifita (knee) and Wade Graham (hamstring) are in doubt. "It's important for us to keep rolling along, especially hitting them when they're down on troops," Maloney said. "It will be interesting to see how they line up this week, obviously a lot of experience and some real senior players there that they're missing. "It's a good opportunity but they'll be backs to the wall mentality. I think they're still finding their way. They've got improvement there and quality players. They'll be tough. We'll come up with the best way to play them."